See below our latest Live Streams here if you missed any and never miss a beat on any announcements made from our channel by Subscribing! 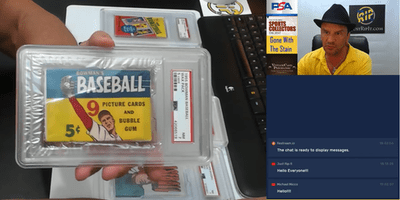 Charlie, every Wednesday night rips open vintage packs that have been sold out on the website. We keep it lively with great music and reward each shareholder their card(s) in the pack. We also have weekly updates about Charlie himself. On top of that, Charlie will give away more than he wants when the excitement is high! Tune in Every Wednesday at 7:00 PM EST. Oh, and we will not stop ripping until all packs on the planet have been ripped open!